Fans of classic cartoon Ren & Stimpy have fond memories of giant red buttons. In an episode titled “Space Madness", Stimpy is put in charge of guarding a big red button, intimidatingly called The History Eraser Button. Ren clues Stimpy in that he’s not sure WHAT the button would do if pressed, it could be something good or it could be something bad. But they’ll never know because nobody is to push the button! “The beautiful, SHINY button! The jolly, candy-like button!" Stimpy only makes it a matter of moments before curiosity (and a loudmouthed narrator) causes him to push the button. Anyhoo, Please, Don’t Touch Anything ($4.99) is built around this exact premise. You, as the player, are visiting a friend at work who leaves you “in charge" while he or she runs off for a bathroom break. In front of you is a big metal control station with a monochrome monitor displaying a city, and a big, juicy, dying-to-be-touched red button. Of course, like our pal Stimpy, there’s just NO WAY you ain’t pushing that button! Once you do a new button unfolds from the massive console, and it looks like a sideways lightswitch. Oh, you just KNOW you’re flipping that bad boy on. Once you do, not much else is happening, so you think, “Hey, I’m going to push the shiny red button again!" And that’s when, following a brief countdown, the city displayed on the monitor blows up into a gigantic mushroom cloud. And this is the way of Please, Don’t Touch Anything. Your goal isn’t necessarily to blow that city up, but that is one of the game’s many endings. Your job is to fiddle around with what’s in front of you on the console, with some subtle hints in the form of posters on the wall, and discover the various endings in the game. I’ve heard it described as similar to a “room escape" game, but since I’ve never (knowingly) played one of those, I’d liken it more to The Room series from Fireproof games. 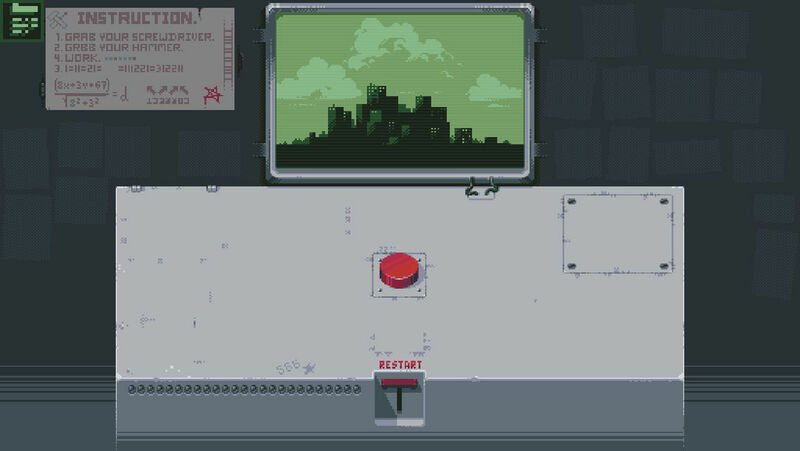 Basically, the control panel in Please, Don’t Touch Anything is a box of riddles, and it’s your job to figure it all out through trial, error, and lots of puzzle solving. That’s about all I can say about Please, Don’t Touch Anything without spoiling the whole game. If you’re into spoilers, or just looking for some help, our forums are the place to be. But the fun really is in discovering things on your own, and my heart flutters when a new panel or button or mini-game pops out from that giant metal cabinet. Five bucks might seem like a lot for a game where it looks like all you do is push a button, but there’s oh so much more to it than that, and some of the puzzles are so fiendish and abstract that I’m sure I’ll be spending days if not weeks getting fully to the bottom of Please, Don’t Touch Anything. If that sounds interesting to you, then check it out, and start touching everything.